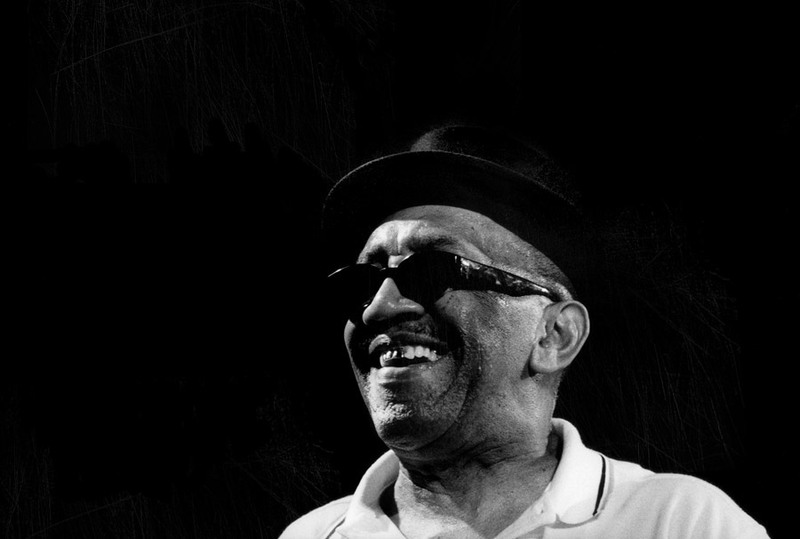 Photo Laurel Aitken black and white photo shot by Floyd Celluloyd for Innermann a decade of reggae photography. Please respect the copyright. Do not use the photos without written permission. Born in Cuba of mixed Cuban and Jamaican descent, Aitken and his family settled in Jamaica in 1938. After an early career working for the Jamaican Tourist Board singing mento songs for visitors arriving at Kingston Harbour, he became a popular nightclub entertainer. His first recordings in the late 1950s were mento tunes such as "Nebuchnezer", "Sweet Chariot" (aka the gospel classic "Swing Low, Sweet Chariot") and "Baba Kill Me Goat". Progressing to a pre-ska shuffle, Aitken's 1958 single "Little Sheila"/"Boogie in My Bones" was one of the first records produced by Chris Blackwell, who founded his Island Records label that year, and the first Jamaican popular music record to be released in the United Kingdom. Other rock and roll singles from this period include "Low Down Dirty Girl", "Drinkin' Whisky" and "More Whisky", produced by Duke Reid. Aitken moved to Brixton, London in 1960 and recorded for the Blue Beat label, releasing fifteen singles before returning to Jamaica in 1963. He recorded for Duke Reid, with backing from The Skatalites on tracks such as "Zion" and "Weary Wanderer", before returning to the UK, where he began working with Pama Records. He recorded hits such as "Fire in Mi Wire" and "Landlord and Tenants", which led to a wider recognition outside of Jamaica and the UK. This cemented his position as one of ska's leading artists and earned him the nicknames The Godfather of Ska, and later Boss Skinhead. He gained a loyal following not only among the West Indian community, but also among mods, skinheads and other ska fans. He had hit records in the United Kingdom and other countries in the 1950s through to the 1970s on labels such as Blue Beat, Pama, Trojan, Rio, Dr. Bird, Nu-Beat, Ska-Beat, and Dice. Aitken performed occasional concerts almost until his death from a heart attack in 2005. After a long campaign, a blue plaque in his honour was put up at his Leicester home in 2007.